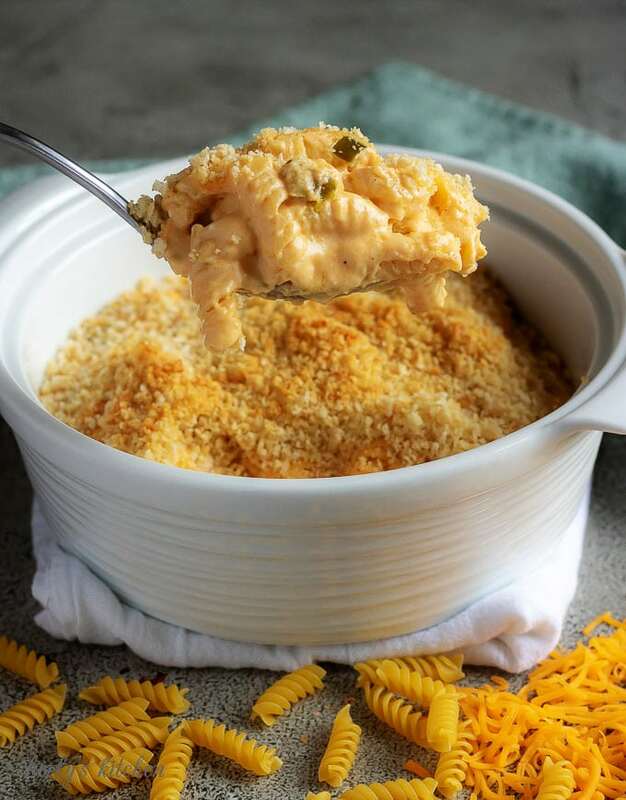 Baked macaroni and cheese has bits of jalapenos, red pepper flakes, cheddar cheese, panko topping, and a secret ingredient to make it extra creamy. Awe, macaroni and cheese! Just typing those words brings back memories of that bright blue box with its bowl of orange, cheese covered noodles. As a kid, I probably ate my weight in macaroni and cheese a hundred times over. It’s one of those foods that never gets old. However, once you get a little older, you start to crave a macaroni and cheese that’ geared towards adults. Don’t get wrong, there’s nothing wrong enjoying the boxed versions, just don’t deny yourself and adult indulgence from time to time. 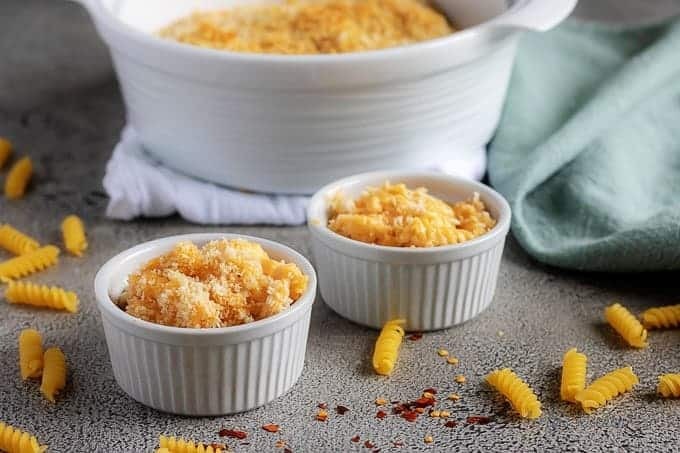 Keeping that in mind, we’ve redone our original baked macaroni and cheese recipe and we’re sharing it with you today. It uses a combination of cheddar and cream cheese combined in a simple white sauce. Resulting in, a creamy, flavorful cheese sauce that’s perfect for pasta. The recipe takes a little time, but I promise it’s worth the effort! Let’s get started. First, preheat your oven to 350 degrees F. and spray a 8-inch casserole dish with non-stick cooking spray. Additionally, you can go ahead and prep the rest of the ingredients. Clean and chop jalapenos, making sure to remove the seed and white interior of the pepper. Then, shred 3-ounces of sharp cheddar cheese, measure 2-ounces of cream cheese, and pour 1 cup of milk into a measuring cup. Set all ingredients aside separately. Once the noodles are prepped and set aside, it’s time to make the roux. In a medium saucepan, melt the butter over medium heat. Afterward, add the flour and whisk everything together to combine. Continue to whisk for 2-3 minutes to cook out any of the raw flour flavor. Now, toss in the chopped jalapenos, red pepper flakes, garlic powder, and paprika. While stirring, let the mixture continue to cook for an additional 30-45 seconds. Then, slowly pour the milk into the roux and whisk to ensure no flour lumps remain. Continue to stir the mixture until the milk begins to steam, but do not allow it to boil! After the milk starts to steam, reduce the heat to low, add the cream cheese, and stir the liquid until the cream cheese melts. The mixture will thicken but keep stirring until the all the cream cheese has melted. Slowly, allow the temperature to come back up slightly, then remove from the heat and add the shredded cheese a little at a time. Whisk the sauce as you add the cheese and ensure all of it, melts before adding more. Begin by carefully pouring the hot cheese sauce over the cooked noodles and toss the pasta to evenly coat the noodles. It’s okay if you have some cheese sauce left over. Put it to good use and serve it as an appetizer with tortilla chips. Place the casserole dish into the preheated oven and bake for 12-15 minutes. Turn the broiler on low for the last 2-3 minutes to make the top crunchy and golden brown. Don’t leave it on broil for too long or the breadcrumbs will burn. Last, remove the baked macaroni and cheese from the oven and serve immediately. First things first, if you don’t want to make a roux, then simply increase the cream cheese amount to 8-ounces and skip the flour step. In other words, saute the vegetables in the butter, add the milk, bring it to temperature and then stir in the cream cheese and cheddar cheese. It won’t be as creamy but it does save you an extra step. Try using different cheeses instead of the cheddar. For example, gouda or provolone make wonderful baked mac and cheese dishes. 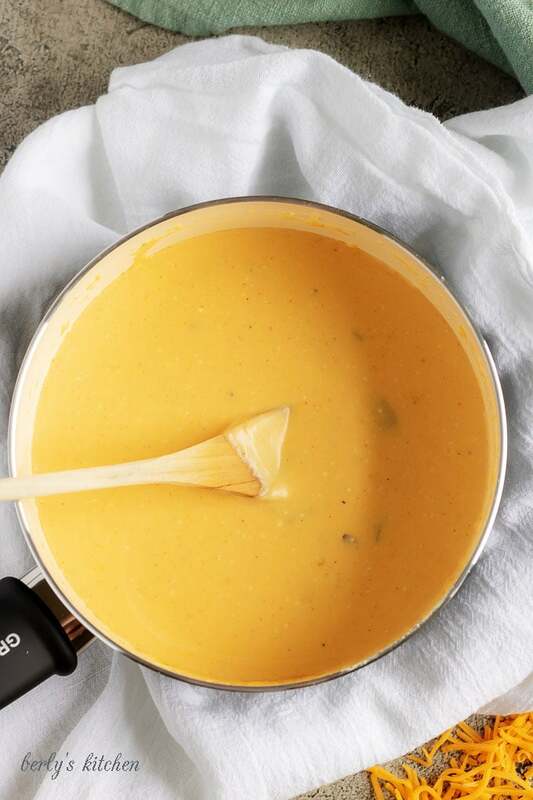 When adding the cheddar cheese, if you find the sauce is cooling to quickly and cheese isn’t melting, simply put the pan back over low-heat to warm up again. It’s important to note, if you have a gas range, then you really have to babysit this dish. 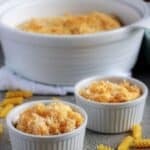 If you like this baked macaroni and cheese recipe, please leave us a comment and rate the recipe card. You can also find us on Facebook, Pinterest, Twitter and Instagram searching for Berly’s Kitchen! Need another warm and comforting side dish idea? Then check out our Instant Pot Loaded Mashed Potatoes! Baked Mac N’ Cheese is the grown-up version of a childhood classic. 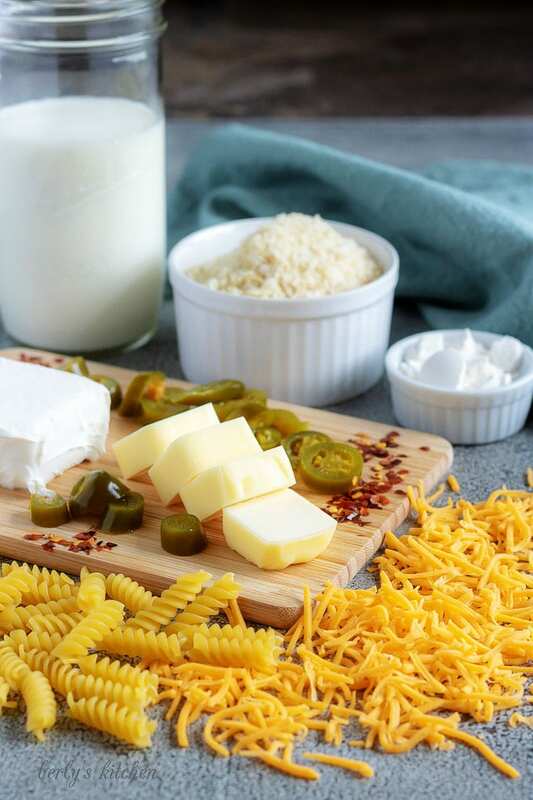 This adult indulgence has bits of spicy jalapenos, red pepper flakes, sharp cheddar cheese, crunchy panko topping, and a secret ingredient that puts the creaminess over the top. Preheat oven to 350 degrees F. and prep an 8-inch baking dish with cooking spray. Cook the pasta noodles. Drain and set aside. Melt the butter in a medium saucepan over medium heat. Add the flour and whisk to combine. Cook for 2-3 minutes. Add the jalapenos, red pepper flakes, garlic powder, and paprika. Stir to combine and cook for an additional 30 seconds. Carefully pour in the milk and whisk to ensure all there are no flour lumps. Heat until the milk steams. Combine the cream cheese and stir constantly until the cream cheese melts. The mixture will begin to thicken. After the cream cheese melts, remove the pan from the heat and slowly add the cheese a little at a time, stirring intermittently. Once the cheese is incorporated, taste the sauce and add salt. Pour the sauce over the cooked noodles and stir to coat. 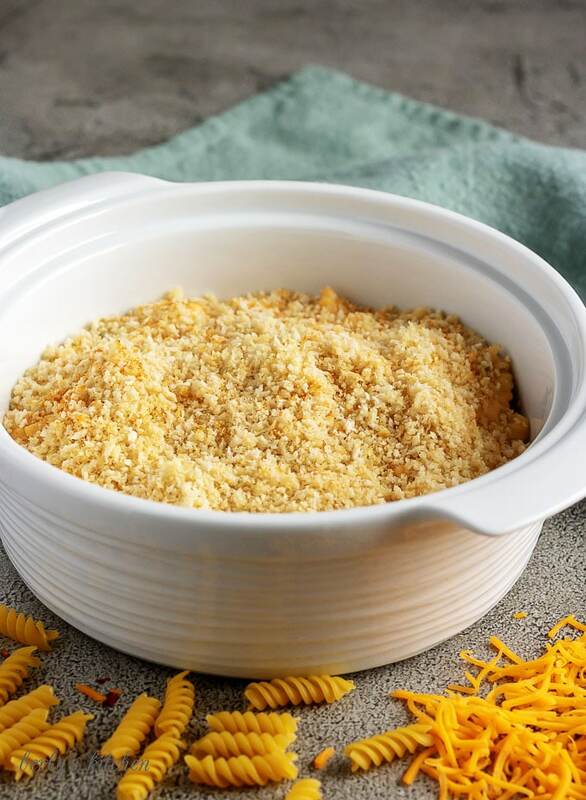 Place the macaroni and cheese into the prepared casserole dish. Place 1 tablespoon of butter and breadcrumbs in a small skillet over low heat. Stir to combine. Continue to stir until the breadcrumbs begin to brown slightly then remove from heat. Add the panko breadcrumbs and press lightly so the breadcrumbs adhere to the noodles. Bake in a preheated oven for 12-15 minutes. To get a crunchy, golden crust, turn the broiler on low for the last 2-3 minutes. Remove and serve. The calories listed are an approximation based on the ingredients and a serving size of approximately 2-ounces of uncooked pasta (about 1 to 1 1/2-cups of the finished dish). Actual calories will vary. Thank you, Anna! If you decide to try it, let me know what you think. This sounds incredible! Mac’n’Cheese isn’t something that is served in restaurants here in Austria, so I am always looking for new recipes 🙂 I will definitely try this soon! Oh my goodness! I am so glad I found this we had something like this a few days ago at a friends house. I was going to get the recipe from her. I will just use this one! Thank you for sharing. Oh man, oven mac’n’cheese is the ultimate comfort food for me! Your recipe looks so good! I love the addition of panko crumbs on top especially. Yum! Yes, please! Love some really good mac n cheese…this looks amazing! YUMMY! This looks SO delicious! Can’t wait to make it! Thanks! This looks incredible , restaurant quality, will try for sure! Omg so yummm… I need to make this!! Thank you, Lindsay! I am glad you like the portion sizing idea. It helps not to overindulge lol! My all time favorite meal! This looks incredible! 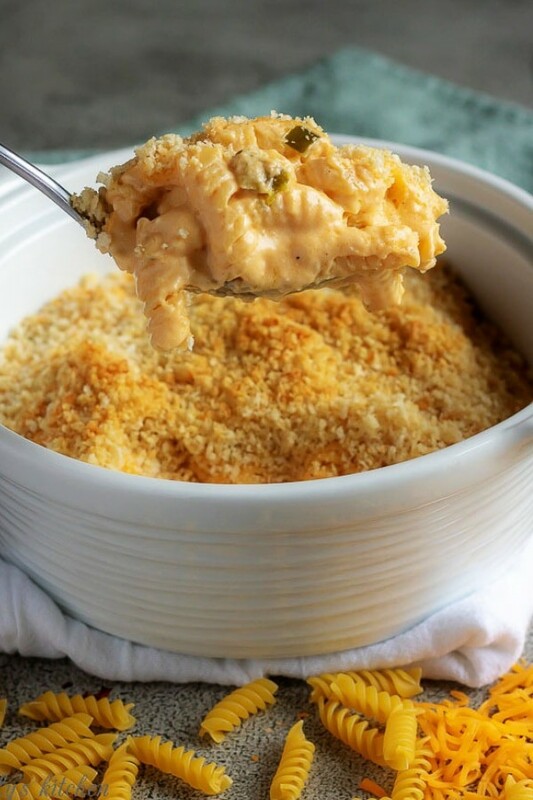 I am going to have to give this mac and cheese recipe a try!